Frozen pie made with condensed milk, whipping cream, pineapples and cream cheese. Prepare the pie shell as directed on the package so that it is fully baked. Let it cool completely. In a mixing bowl, beat the heavy whipping cream until soft peaks form. Beat in the powdered sugar and vanilla and stop whipping when peaks are stiff. In a second bowl, beat the cream cheese until soft; beat in the condensed milk. Stir in the pineapple, then fold in the sweetened whipped cream and pecans (or leave out the pecans and sprinkle them on top only). Pile as much filling as you can into the deep dish crust – most of it should fit if you're using a deep dish 9 inch or 10 inch pie plate. If the filling is runny, just fit as much in as you can. It will firm up in the freezer. 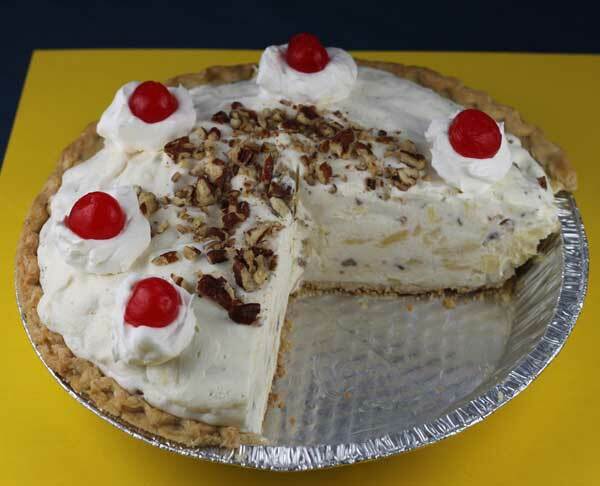 Put the pie in the freezer and freeze for several hours or until it is firm enough to cut neatly. Shortly before serving, removing the pie from the freezer, cut and plate. Let the cut pieces come to room temperature before serving. Alternatively, you can cut the pie into pieces, wrap them individually in plastic and put the wrapped pieces in a freezer bag. The cut pieces will last for 2 or 3 weeks (maybe longer) and only need a few minutes to thaw.